The surface reasons are things like: not feeling well, lacking the inspiration, too many insights coming through so fast that picking one to write about is difficult, beautiful weather beckoning me outdoors, drawers and cabinets to clean out and organize, get-togethers with friends, client calls, brainstorming and mind-mapping my new offerings and directions, physical therapy sessions (for a frozen shoulder) interrupting my creative time. Subterranean reasons are, well they are subterranean, so I am not all that aware of them. My guess about the subterranean reason is that I’m in a period of rapid change and what used to satisfy me as a post, is shifting. What is it I want to say now? What wants to be shared from this place, this raw, smack-dab-in-the-middle-of-it terrain? I guess we’ll find out over the next few months. Meanwhile, I know some people have been waiting for my next post, because they’ve written to me or told me face to face that they are wondering why I’ve not posted lately. Thank you faithful readers! I count you among my blessings. Speaking of which, I want to share with you one of the practices that spontaneously burst out of me one morning during a few days of peak discomfort. It brought me relief and heartened me. Thank you for the blessing of another day. Thank you for the blessing of full breaths. Thank you for the blessing of the smell of coffee. 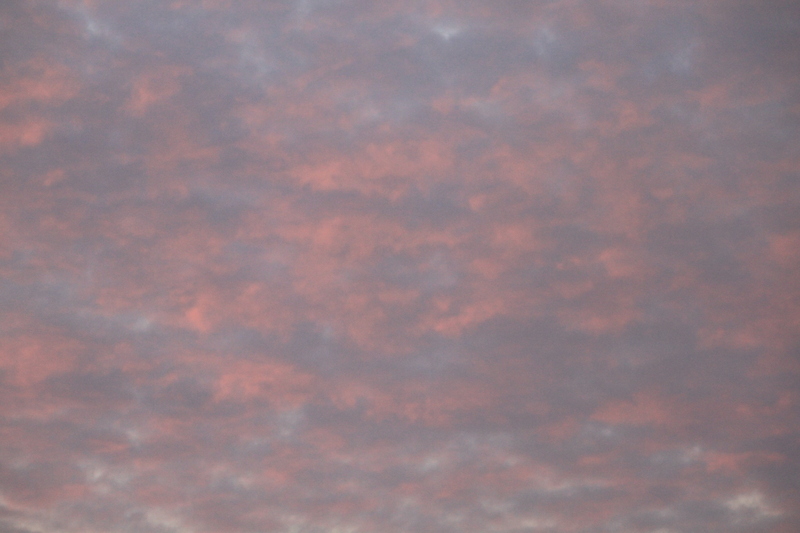 Thank you for the blessing of the pink clouds at sunrise. Thank you for the blessing of a wonderful new client. Thank you for the blessing of friends and family who care. Thank you for the blessing of a heater that works and warms my house. Thank you for the blessing of these feet and legs that walk and dance. It’s all really simple isn’t it? Simple and complex; like breathing. We are living through some tough times. A courageous heart is one filled with radiant love and light. We can’t go to the well often enough to drink of beauty and raise our vibration. As with any ritual, it is easier to remember to actually do it if we practice regularly. So, I’ve begun what I call the Ten Blessings Breakfast. However, lately it’s become, Ten Blessings Wakeup, since I have fallen into an awareness that has me look for the blessings immediately upon awakening. I also have added it to my evening ritual – Ten Blessings Bedtime. I’ve had occasion to play with it as Ten Blessings Bruhaha. This one I use whenever something comes up that throws me into anxiety or fear; generally conflict in my body, my life or in the world. Recognizing and saying ten blessings in such moments soothes me and brings me present. Most of what I fear is a projection of what might happen (and likely won’t). Most of what causes me grief is past. When I look at this very now moment, I see that right here, right now, there is much to enjoy, embrace and savor. Why ten? Intuitively, it struck me as a good number. It was something I had to reach for so I would not just stop at a few. In certain studies it is also the number where completion and beginning meet: 1 and 0. The ten blessings practice opened the way for some amazing insights regarding pain, fear, wholeness and separateness and I plan to share these with you in coming posts. For now, I’m headed out for an unlimited blessings walk. We are blessed without limits when we can look and see. And when we can not a practice like this will begin to shift us from the negative to the positive. Please keep probing, writing, and being you! I love you, Kathy! I am IN! I will start today, and have a Ten Blessings Lunch! Thank you Lori, Daisy and Patrick. Three blessings brought to me by way of Twitter and/or Facebook. You are three amazing individuals (who should all meet each other if you haven’t yet) and I am deeply grateful for our connection. Thanks for stopping by and commenting. I love knowing you were here! Thank you for a blessed beginning of my day! There is a time to share outwardly and a time to stay within. Thanks for honoring yourself that way and then sharing it with us. I find gratitude, or counting my blessings, always shifts my perspective on anything and everything! What a difference this had made- it’s helped calm me and helped me feel the connection that IS! So glad you wrote about this – and I’m looking forward to your upcoming insights!!! p.s. Ten Blessing Bruhaha – lol – you are wonderful!! !